Oddworld is a broad well rounded fictional universe created by the development team Oddworld Inhabitants. Originally the Oddworld series was supposed to contain five main titles, called the Oddworld Quintology. 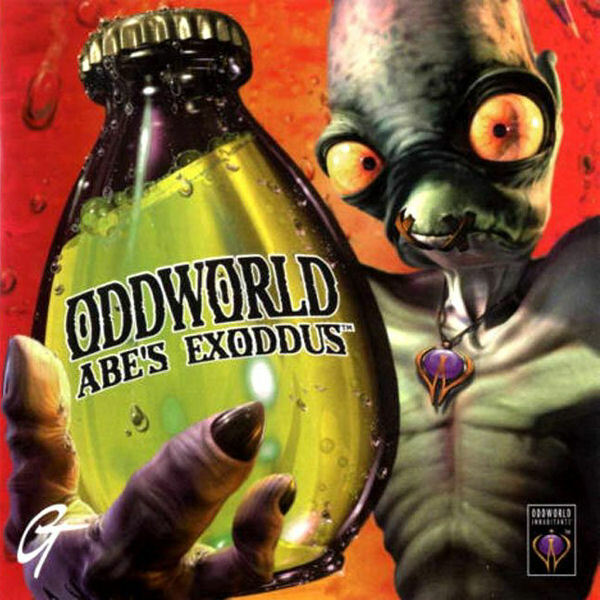 Thus far two titles have been released, Abe's Oddysee and Munch's Oddysee, with the bonus games Abe's Exoddus and Stranger's Wrath (as well as the handheld ports) not counting towards the pentalogy. 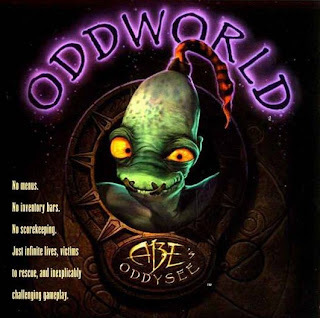 Thus far the story of Oddworld has been told almost exclusively by video games; With one short film retelling the story of Abe's Exoddus, mostly with reused cutscenes from the game. 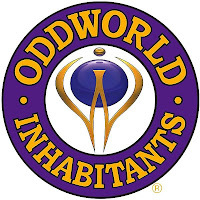 Oddworld Inhabitants have also expressed an interest in making films, so we very well might see some full Oddworld films in the future. Throughout all the current media on it, Oddworld, is a peaceful planet in jeopardy. The industrial ambitions of corporations are enslaving native populations and destroying the natural landscapes in a mad dash to acquire wealth. The main protagonist Abe, is a Mudokon who starts off as a slave in the RuptureFarms meat processing plant. He is a pacifist by nature and will not pick up a weapon or engage in combat; But instead uses stealth and his psychic powers to accomplish his quest to win his freedom, free other slaves, and stop the evil corporations from destroying the planet. 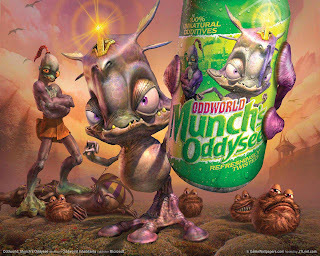 Latter in Munch's Oddysee he teams up with Munch, the last surviving adult Gabbit, and helps save his race from extinction by saving the last remaining baby Gabbit eggs. Munch is less of a pacifist and can become very ruthless when angered; Not that he is particularly good at combat. His main abilities lies in manipulating machines and sonar tacking, both which he is able to do though a SkullJack surgically installed into his head. Additionally, he is a natural swimmer, something Abe has never been able to manage. 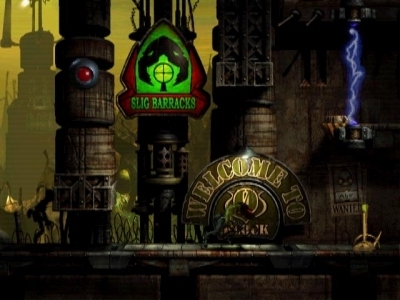 Abe's Oddysee, the first game in the Oddworld Quintology, is a two dimensional platforming game split into individual screens. It was released in 1997 for the PlayStation, DOS, Windows, Game Boy, and more recently the PlayStation Network. He starts off the game as a slave in RuptureFarms, a Glukkon run meat processing plant; But the plant has a problem, the ingredients for their products are quickly going extinct. In Abe's job as a floor waxer he overhears a board meeting about this very subject. They have a solution to this problem, a new product and a new source of meat, Mudokon Pops, made from Abe's own people, Mudokon slaves. So Abe escapes from the plant and on the way he encounters a shaman, BigFace. BigFace tells him that he is prophesied to rescue his enslaved people and restore the damaged and conquered land. But first Abe must travel the land and complete two test to gain the power of Shrykull. Abe completes these tasks and journeys back to RuptureFarms, rescues his fellow slave Mudokon, and comes close to shutting down the factory completely before he is captured. 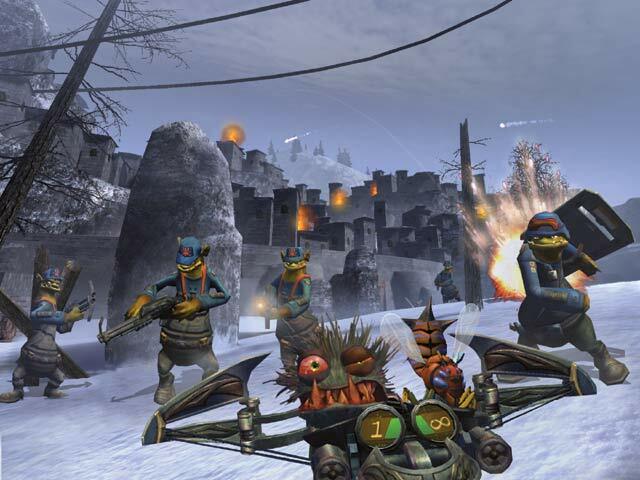 The game has two ending, one good the other bad; The good version is considered canonical and is triggered if at least fifty out of the ninety nine Mudokon slaves are rescued. In the good ending Abe is saved by the Mudokun slaves he saved. The sequel to Abe's Oddysee, Abe's Exoddus, starts off right after the end of the first game and is considered a bonus title and is not part of the main series, but is considered canonical. The games mechanics are pretty much the same as the first game with little being added or changed and it was released for the same platforms in 1998. In Abe's Exoddus, Abe learns that Glukkons are using Mudokon slaves to exhume bones from the sacred Mudokon burial ground at Necrum. So Abe travels to the Necrum mines, destroys them, and frees several trapped Mudokon spirits. He then travels to Soulstorm Brewery, overcoming many obstacles on the way, and explores the complex eventually destroying it. This game also has two endings, one good and one bad. Again the good ending is considered canonical, and is triggered if 150 or more out of the 300 Mudokons are rescued. 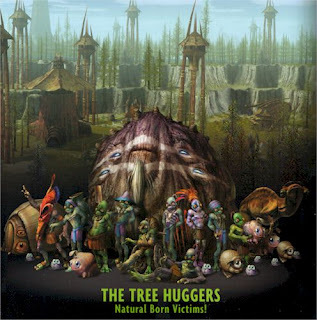 The second, and last released thus far, game in the main Oddworld Quintology is Munch's Oddysee. It was originally a Xbox exclusive platforming game in 2001, but now has a GBA port and a planned port to the PC. As well as introducing a new protagonist, Munche's Oddysee also is the first game in the series to be 3D. This new protagonist is called Munche. He is a Gabbit, and the last adult left in his species, the other being fished to near-extinction. The only hope left for the species is a small bunch of eggs in Vykker fortress, Vykkers Labs. Unfortunately, while Munch is naively going about his life, unaware of all of this, he is captured by the Vykker and brought to Vykker Labs. These captors want to use him as a aquatic slave and to increase his usefulness they implant a sparking sonar device into his head. Unexpectedly, this device gives Munch the ability to manipulate machines, which he uses to free some other captives called Fuzzles and together they escape the facility. In his escape Munch runs into Abe and together they are told by the Almighty Raisin that they must go back into Vykker Labs to save both Munch's species form extinction and a large stockpile of Mudokon eggs, intended for slavery. Together, they infiltrate into Vykker Labs and rescue the both the Mudokon and Gambit eggs, destroying Vykkers Labs in the process. 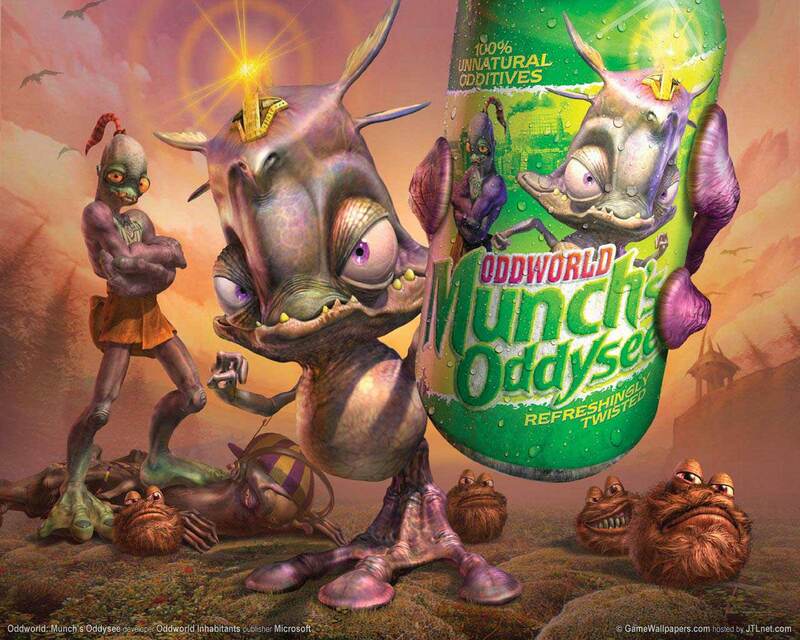 Like all previous games in the series, Munch's Oddysee, contains a good and bad ending. In the bad ending the Gambit eggs are not saved and both Abe and Munch are killed. 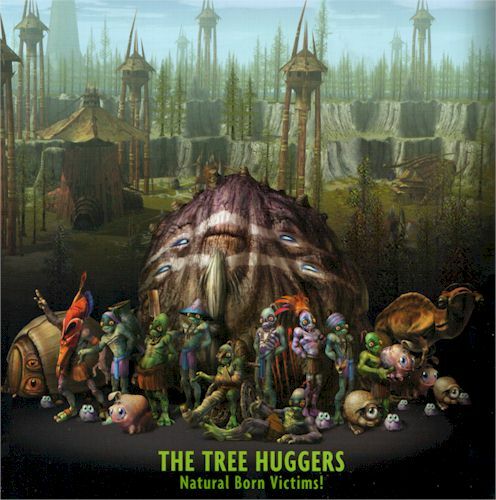 The last game released by Oddworld Inhabitants, Stranger's Wrath, is a big departure from the rest of games based in the Oddworld universe. It is a action adventure with both first and third person perspectives that are seamlessly transitioned between during gameplay; The first person perspective is used for ranged combat, while the third person view is used for exploration, platforming, and melee combat. 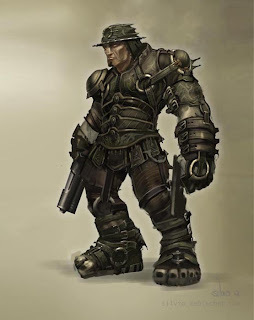 In Stranger's Wrath you play a bounty hunter called Stranger. His ultimate goal is to earn enough money to pay for a life saving operation, and he does this by capturing criminals dead or preferably alive (for more money). In general the game is separated into getting to the criminal bosses, and the boss fights themselves, and along the way you will encounter loads of minions both before and often during the boss fights. What really makes the game standout is the unusual living ammunition, varied level design, and unique boss fights. 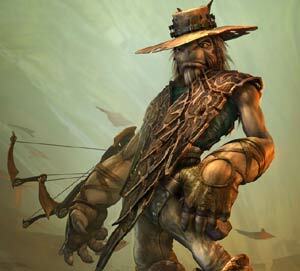 Stranger's Wrath was released for the Xbox in 2005 and currently has a planned port to both the PlayStation 3 and PC. that never got to see the light of day. It was the planned third game in the Oddworld Quintology and would of revolved around a character named Squeek, a creature thought unimportant that is involved in some form of symbiosis. Another game never released, and probably the most unusual of the bunch, is The Hand of Odd. It does not focus on a single protagonist, but instead allows you to control an army of characters and influence them and their environment. The game would of had both single and multi player aspects and would of been an RTS and the first game in the Habitales series. The last never released title is The Brutal Ballad of Fangus Klot. 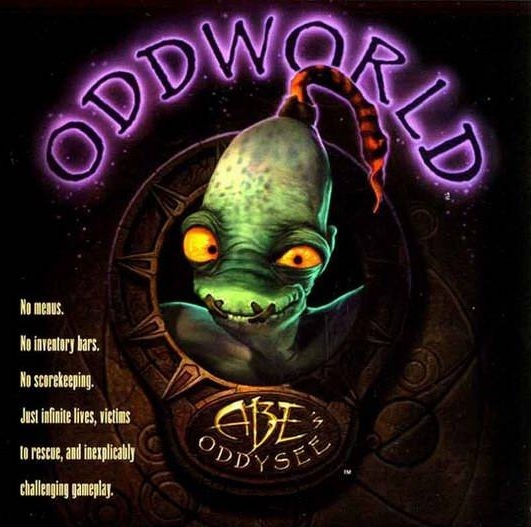 It is probably the most mature title ever conceived by Oddworld Inhabitants and was expected to get a M rating. It tells the story of Fangus, a Sheppard, who takes up arms to defend his homeland from invaders. Its gameplay is similar to Stranger's Wrath in that it would of featured both first and third person perspectives. 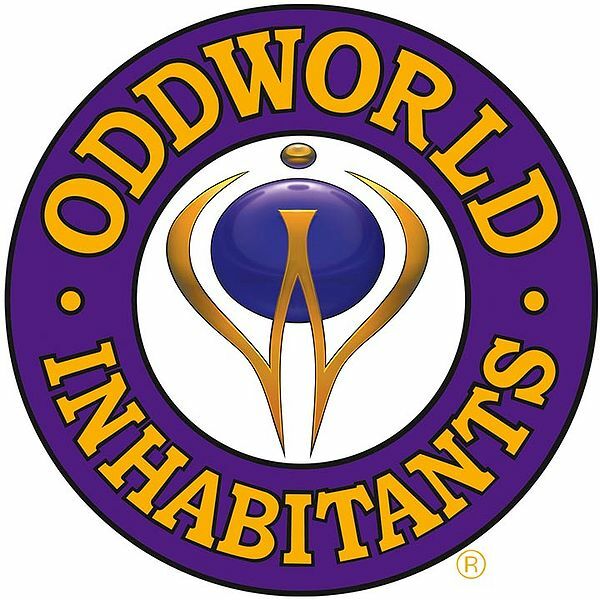 So now you know the history of Oddworld, but what is upcoming with both it and Oddworld Inhabitants? 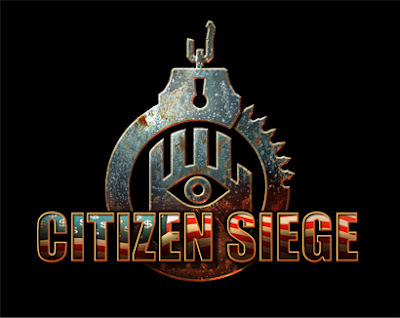 Currently, Oddworld Inhabitants is working on a feature film entitled Citizen Siege and two integrated video games, all of which are set in a dystopian near future Earth and not related to Oddworld at all. It seems the future of Oddworld might lie in another development company, as the developer Just Add Water has confirmed it is currently developing many Oddworld games. 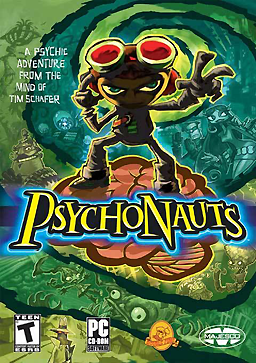 Psychonauts is a action platformer that was originally planned for release exclusively on the Xbox but was later ported to the Playstation 2, Windows, and made compatible with the Xbox 360. It was designed by Tim Schafer and worked on by several other people from Grim Fandango team. In additional to being one of my personal favourite games of all time and easily the best game on the original Xbox, it is also widely critically acclaimed with Tim Schafer going as far as to call it “the greatest game of all time ever”, a sentiment shared by others. 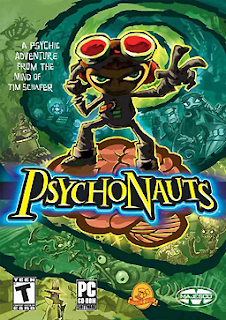 Surprisingly for an action platformer, Psychonauts has a great storytelling that plays a prominent part in the game and includes great humour similar to the Monkey Island series and interesting dialogue on par with Grim Fandango. 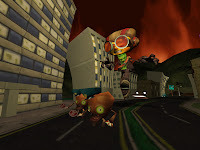 In addition to the normal platforming and action, Psychonauts also features a collectible based levelling system and the ability to buy useful items paid for by other collectibles. The levels and items for the most part give you new abilities and improve your existing abilities; These abilities include among others: telekinesis, levitation, invisibility, pyrokinesis, Psi Shield, and Psi Blast. parody of giant monster films. 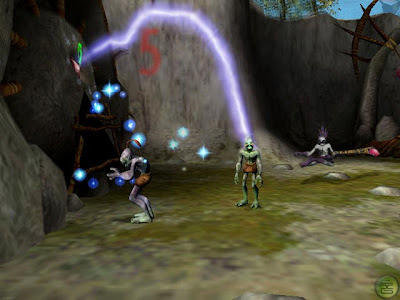 In the game the player controls Razputin “Raz” Aquato at Whispering Rock Psychic Summer Camp; Where he has gone to try and become a Psychonaut. In the game Raz explores the physical camp, learning from the camp counsellors, finding collectibles, and getting missions; But most of the game is played inside of NPC's minds. While he advances through the story he encounters many interesting characters that are either blocking his path or are needed it do something for Raz to progress and in general have some kind of emotional problem that Raz has to help them with. To help them Raz enters their minds, which are portrayed as a kind of fantastic and improbable world built on the eccentricities and personalty of the owner. The challenge in these fantastic imaginary worlds and the physical world are a combination of moderately challenging platforming, unique boss fights, and a few naturalistic puzzles. During the development of Psychonauts many major changes to the original idea have occurred. Originally Tim Schafer had an idea for a drug induced psychedelic experience occurring in Full Throttle, which was rejected for not being family friendly enough. Latter, while developing this idea into a game, Raz was going to be a crazy and unbalanced ostrich suffering from multiple personalities; This was later changed, because they wanted a character that the player could relate to and wish to be like. In summery this is a great game, that should easily make it into everyone’s “Best Games of All Time” list. What really puts it over the top is its amazingly humorous dialogue and great story. And while the game could benefit from having a difficulty setting as it is moderately easy for experienced players, it does not make it any less enjoyable.